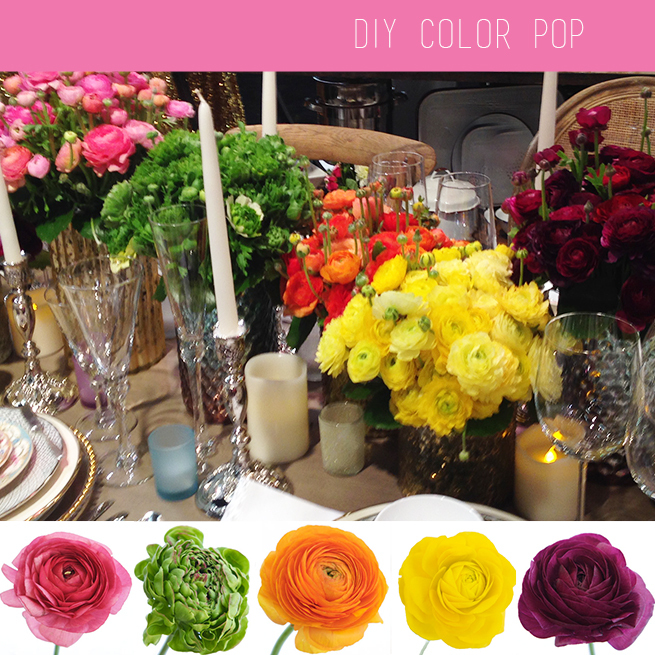 Looking for a bold and easy DIY Centerpiece for your wedding? Pairing multiple solid colors is sometimes called color blocking. To recreate this look choose colors that are opposites on the color wheel. Then place vessels with these one-color bouquets around the table in varying heights. We love the pink, green, orange, yellow and burgundy combo shown below. The flowers shown are ranunculus but you can choose your favorite colors and varieties to recreate this design. We love color blocking with bunches of flowers in a range of complimentary solid colors. Shop 50+ colors of wedding flowers now to find your perfect palette and favorite flower varieties. This design was recently shared with Event Pros at The Special Event convention – thanks for inspiring us with this table design.